The photo is heartbreaking. A frightened baby elephant anxiously nuzzling its mother's lifeless body, trying in vain to wake her. No, the adult elephant didn't die of natural causes. Nor was she killed by poachers for her ivory tusks. What has turned elephant calves into orphans and left entire elephant families decimated is much more mundane, but no less tragic: palm oil. Palm oil, obtained from the fruit of the African oil palm tree, is used in many food, cosmetic, and household products, and its popularity has skyrocketed. Palm oil is now thought to eclipse soybean oil as the world's most widely produced edible oil. But that popularity comes at a deadly price. As demand increases, so does destruction of precious tropical environments where the oil palm tree grows. Rainforests around the world are being bulldozed at the rate of 300 football fields per hour to make way for palm oil plantations, pushing endangered and threatened species closer to extinction. Just a few weeks ago, CNN reported that at least 14 endangered pygmy elephants were found dead in Malaysia. Although the investigation is ongoing, officials believe that palm oil plantation workers had deliberately poisoned the elephants to prevent these "pests" from eating the palm fruit and cutting into corporate profits. The palm oil boon is also victimizing orangutans, humankind's closest relatives. Right now the single greatest threat facing the orangutan population is the expanding palm oil trade. Estimates show that if the current trends continue, orangutans will be extinct within 10-20 years. While many vegetarians and vegans are aware of habitat destruction caused by cattle (Greenpeace reports that up to 80 percent of deforestation in the Amazon stems from cattle ranching), fewer know about the horrific consequences of palm oil production. Earth Balance, the butter substitute that is a favorite among vegans, has been pressured to ensure that the palm oil they use is not causing harm to animals or the environment. 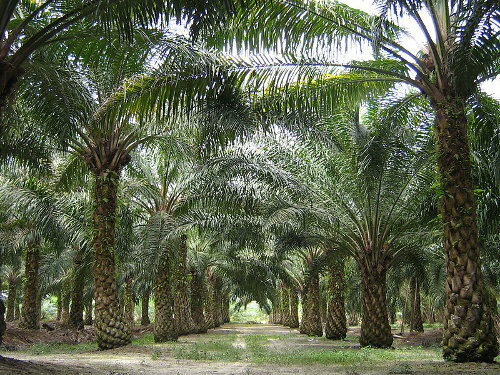 Earth Balance has responded by making a commitment to use only "sustainable" palm oil. Read their policy here and decide for yourself. The Tofurkey company states that they "used to use sustainably produced palm oil" in their Tofurkey Roast, another vegan favorite, but that the ingredient was eliminated in 2011. However, "the product packaging was not appropriately updated," so customers may still see Tofurkey Roasts and Tofurkey Feasts on the shelves that have palm oil listed in the ingredients, at least until the products reach their expiration date later in 2013. Palm oil is also widely used in non-food products such as toothpaste, laundry powders, detergents, cosmetics, and pet food, just to name a few. Those who wish to avoid palm oil altogether can click here for a list of both food and non-food products that are POF (palm oil free). The Rainforest Action Network also has extensive information about palm oil issues on their website here. Massachusetts Elizabeth is a writer, educator, and vegan advocate. She lives on the Massachusetts/New Hampshire border with her husband and their quirky animal companions: a dog, two cats, and four fish (all rescues). An avid plant-based cook, she's proud to have finally perfected vegan versions of foods from her dual heritage—meatloaf, mac and cheese, and bacon from her Southern side, as well as potstickers, summer rolls, and wonton soup from her Asian side. (Plus she makes a drool-worthy buffalo wing pizza.) Elizabeth is the creator of the website MassVegan.org and founder of Vegans of North Central Mass.